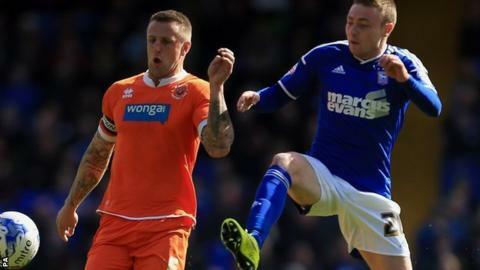 Ipswich moved into the Championship play-off places with a dramatic victory over already-relegated Blackpool thanks to Christophe Berra's late header. The Tangerines took a shock lead when Andrea Orlandi coolly swept home Henry Cameron's ball in from the left. Cameron levelled for Blackpool midway through the second half before Berra headed in a late home winner. The result means Ipswich climb up to sixth on goal difference thanks to Birmingham's victory over West Midlands rivals Wolves. The visitors went in front with their first meaningful attack when Cameron crossed from the left for Orlandi, who kept his cool to slot home with his left foot from inside the box. Blackpool have still never won at Portman Road in 12 attempts. They are also the only Football League side still to record an away win this season. Luke Varney failed to convert a simple chance to level from six yards out when he headed wide from Teddy Bishop's corner. But the home pressure told when Freddie Sears brought Ipswich level with his sixth goal since moving from Colchester in January and his 20th for the campaign overall. Tyrone Mings nodded a right-wing free-kick back into the danger zone and the diminutive striker volleyed into the roof of the net. Sears scored his and Ipswich's second inside four minutes when he slipped under Parish after good approach play by Daryl Murphy, Luke Chambers and substitute Paul Anderson. As the game moved into the second half, Sears cut inside his marker only to be denied by Parish. And the home side were made to pay for those misses when Cameron turned in Gary Madine's far post cross following a quick free-kick. However, Ipswich kept their cool and were rewarded when Berra nodded in from six yards out at the far post from Murphy's cross. "We deserved to win and at this moment in time it doesn't really matter how we get the three points. "We had enough chances to win two matches. We would love to be sweeping everyone aside but we haven't done that all season. "We now have 71 points, my best total since I've been here, but we are still nowhere near clinching a top-six spot. It is nice being back in the top six but my mantra all season has been that it will go right to the end." "I am a big admirer of Mick McCarthy and his teams so I expected a difficult game. But for us to come here and be 10 minutes away from getting a point was encouraging. "I was also pleased with how some of our youngsters played, especially Henry Cameron who made one and scored one. "I now need to make decisions about who will be part of the huge rebuilding job we need to do over the summer. I have told the players they are playing for their futures, whether here or at another club, and also for their wives and their children as so many are out of contract." Match ends, Ipswich Town 3, Blackpool 2. Second Half ends, Ipswich Town 3, Blackpool 2. Attempt missed. Gary Madine (Blackpool) header from the centre of the box is just a bit too high. Assisted by Jamie O'Hara with a cross following a corner. Corner, Blackpool. Conceded by Luke Chambers. Offside, Blackpool. Elliot Parish tries a through ball, but Andrea Orlandi is caught offside. David Ferguson (Blackpool) wins a free kick on the left wing. Gary Madine (Blackpool) wins a free kick on the left wing. Offside, Blackpool. David Ferguson tries a through ball, but Bright Samuel is caught offside. Substitution, Blackpool. Nathan Delfouneso replaces José Cubero. Charles Dunne (Blackpool) wins a free kick in the defensive half. Substitution, Ipswich Town. Jonathan Parr replaces Tyrone Mings. Goal! Ipswich Town 3, Blackpool 2. Christophe Berra (Ipswich Town) header from the left side of the six yard box to the top left corner. Assisted by Daryl Murphy with a cross following a set piece situation. Daryl Murphy (Ipswich Town) wins a free kick on the left wing. Foul by Niall Maher (Blackpool). Cole Skuse (Ipswich Town) wins a free kick in the defensive half. Corner, Blackpool. Conceded by Tommy Smith. Attempt saved. Luke Chambers (Ipswich Town) header from the centre of the box is saved in the top centre of the goal. Assisted by Jonathan Williams with a cross. Attempt blocked. Gary Madine (Blackpool) left footed shot from outside the box is blocked. Substitution, Ipswich Town. Jonathan Williams replaces Jay Tabb. Offside, Blackpool. Peter Clarke tries a through ball, but Gary Madine is caught offside. Delay in match Niall Maher (Blackpool) because of an injury. Corner, Ipswich Town. Conceded by Niall Maher. Substitution, Blackpool. Bright Samuel replaces Henry Cameron because of an injury. Corner, Ipswich Town. Conceded by Charles Dunne. Attempt missed. Tyrone Mings (Ipswich Town) left footed shot from the centre of the box is high and wide to the left. Assisted by Teddy Bishop with a cross. Goal! Ipswich Town 2, Blackpool 2. Henry Cameron (Blackpool) right footed shot from very close range to the bottom right corner. Assisted by Gary Madine with a cross following a set piece situation. Andrea Orlandi (Blackpool) wins a free kick on the right wing.